First of all, who can blame our horses! It looks like a super-sized version of the injection your horse has every year, and it doesn’t really smell like something tasty either. Some horses do remember what you did a few months ago, and they will have none of that! What now? Of course, you can try and stand on tiptoes trying to pull a 120 Pound head down and forcing the worming paste into hour horse’s mouth. Most of the time this results in very little paste for your horse but lots of it all over your hands and clothes. So, what are the alternatives if you don’t have one of these angels who simply doesn’t object to any kind of veterinary treatment? If you have plenty of time and patience, then rinse the inside of an empty worming-syringe and fill it with something your horse really likes (preferably something not too liquid). Apple sauce works really well. Push a little sauce out on to the tip of the syringe, and let your horse have a sniff. If he is happy with that, go a step further and touch your horse’s lips leaving a tiny bit of apple sauce for him to lick. Happy horse? Then, we will go a step further and push the syringe gently into the space you would usually see the bit. If your horse is still ok, then, squeeze the apple sauce into his mouth. Keep doing that every other week, and your syringe should no longer represent a threat. This is, as you can imagine, not a quick fix, and exactly the best option if you have been told to worm your horse NOW. Sometimes, it is not really the actual process of worming but the way we handle the process. 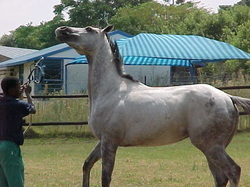 If your heart rate has already doubled, your horse can see you approaching the stable in strange ways, your behaviour gets a little more hectic (trying to get done with it as quickly as possible), your voice changes to a “calming- woohoo, good boy, good girl”, before you even get to the stable – I don’t blame your horse for fearing the worst! Try and keep everything as normal as possible, and stay calm, and you might be surprised to see your horse reflecting your mental state! If you want to find out more about worming – types of worms, when to worm, etc. – have a look at the BHS Worm Control booklet.